Family of printers and publishers of Hebrew books in Wilna. The family formerly lived in Grodno, where the book-dealer Baruch b. Joseph Romm established a printing-office in 1789. The Romm Hebrew printing-office was the first in Lithuania, and its authorization by King Stanislaus August was considered an important event. In 1799 Baruch removed to Wilna, where he died April 29, 1803. The business was inherited by his son Menahem Man Romm, who in 1835 began, in partnership with Simḥah Zimel of Grodno, the crowning effort of a Jewish printer's career—the publication of a new edition of the Talmud. The first volumes of that edition bear the imprint "Wilna and Grodno"; the later volumes have that of Wilna only; but the work was really done in Ozar, near Grodno. Menahem Romm died Oct. 13, 1841, and was succeeded by his only son, Joseph Reuben Romm, under whom the printing-house was formally established in Wilna in 1847, although the report of a conflagration ("Allg. Zeit. des Jud." 1840, No. 20) proves that it had even previously been of considerable size and importance. He died Feb. 28, 1858, and left three sons, David, Ḥayyim Jacob (d. Aug. 30, 1869), and Menahem Gabriel. David, who was the head of the firm, died suddenly March 9, 1860, while on his way from St. Petersburg, where he had obtained a practical monopoly of the Hebrew printing and publishing business in Russia. After his death the monopoly was broken, and numerous printing establishments sprang up in various parts of the empire. 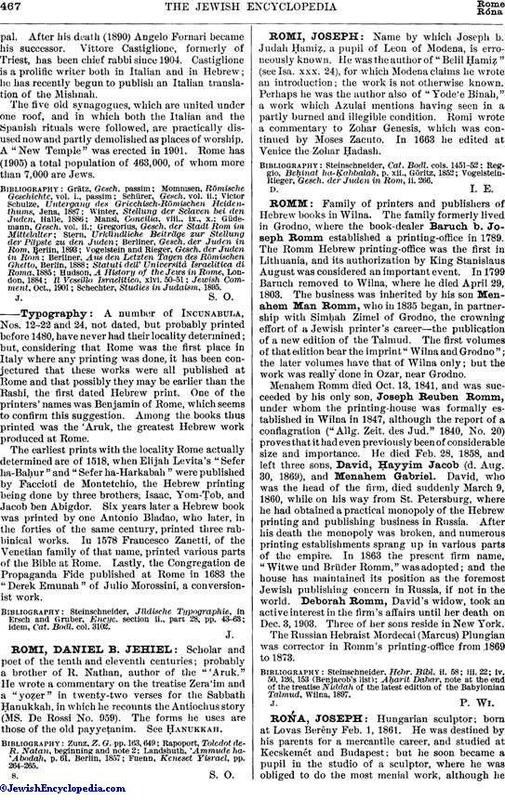 In 1863 the present firm name, "Witwe und Brüder Romm," was adopted; and the house has maintained its position as the foremost Jewish publishing concern in Russia, if not in the world. Deborah Romm, David's widow, took an active interest in the firm's affairs until her death on Dec. 3, 1903. Three of her sons reside in New York. The Russian Hebraist Mordecai (Marcus) Plungian was corrector in Romm's printing-office from 1869 to 1873. Aḥarit Dabar, note at the end of the treatise Niddah of the latest edition of the Babylonian Talmud, Wilna, 1897.